Shown with TA-8 Steel Casing as example. The pre-finished steel Classic Frame is our most popular frame profile. It is an ideal solution for most commercial drywall applications. E-Series is not available on this website. Please consult factory for further information. A-Series Frames are the perfect companion for the S-Series and C-Series Frame. Use A-Series adjustable Frames to prevent jobsite problems from walls of varying wall thickness or non-standard Jamb debth. A-Series frames are also the solution where pre-hung assemblies are required. TA-46 Gasket: available in Black, Grey, White, Brown and Beige. CK-Series Frames were designed specifically for the Hotel/Motel market where creating a quietstress free environment for travelers is of the utmost importance. 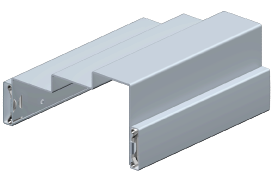 The CK-Series is also a great option for any opening requiring a Smoke Seal, Weatherstrip or STC rating. Shown with Wood Casing Supplied by Others. 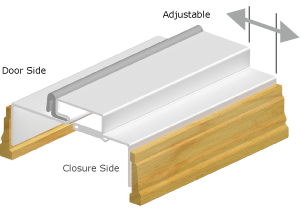 The AK-Series Frame was designed specifically for the Residential Market where Weatherstripping, Thresholds, and Pre-Hanging are common requirements. 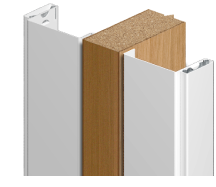 AK-Series frames are also the solution for House to Garage openings where Fire Ratings and Security are are important. 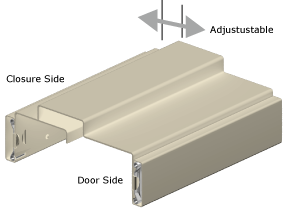 DE-Series Frames are commonly used for openings requiring Doors swinging in opposite directions. 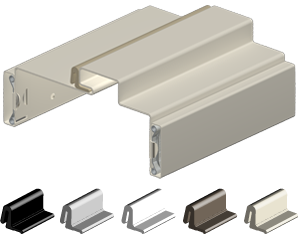 P-Series trim kits are used to trim out Pocket Door openings. 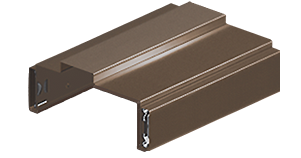 The purpose of the P-Series is to make Pocket Door openings consistent with other Timely Frames on the job site.